At Sydney’s northernmost tip is Palm Beach, a suburb that sits on a slim peninsula of land bordered by water on three sides. 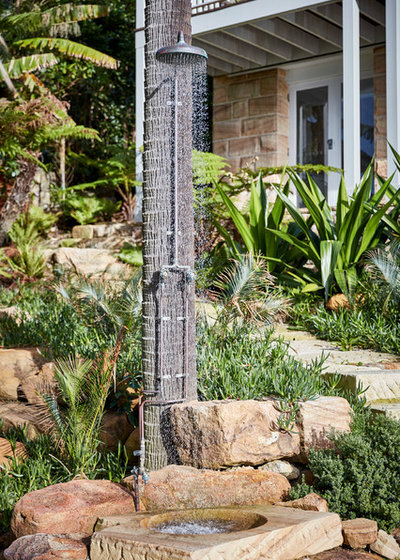 This is the backdrop of this 1920s holiday home, a grand dame of a house that stood largely unattended and hidden by trees and shrubs until a family spotted it, bought it and undertook a massive renovation. 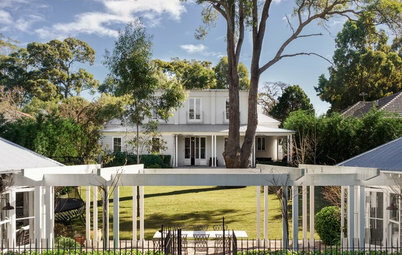 With the help of Bentley Design, they maintained the house’s century-old architecture, including most importantly the original golden sandstone featured inside and out. 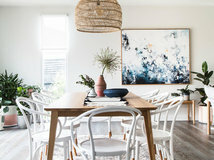 Structural elements such as the ceiling beams and timber detailing were left exposed to show off their raw beauty, and the living room was returned to its former glory with a careful makeover. 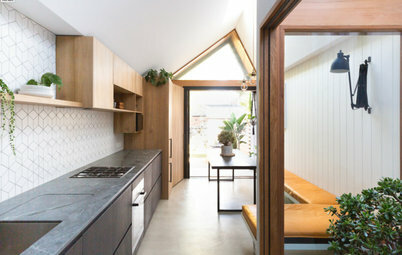 In addition, the kitchen was opened up to provide better connection to the surrounding living areas, a wraparound verandah was added for indoor/outdoor living, and open areas downstairs were enclosed to create private spaces for the family’s children when the house is in use. The original home was very rundown and needed a lot of attention, but there was beauty in its grand old bones. 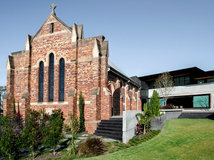 The family wanted to preserve the building rather than replace it with a modern substitute, so Bentley’s design called for part-restoration and part-renovation. 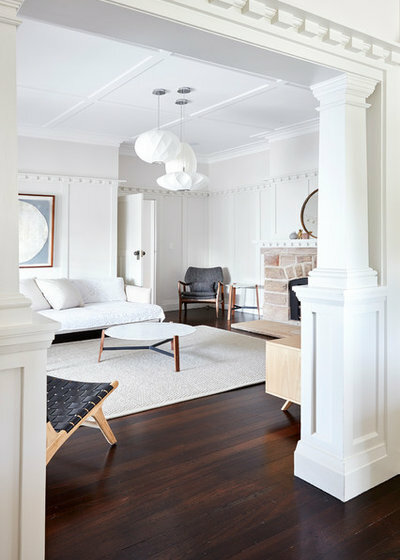 Ornate architraves, picture rails, cornices and skirting boards sit alongside the original sandstone fireplace, and salute the site’s century-old architecture. 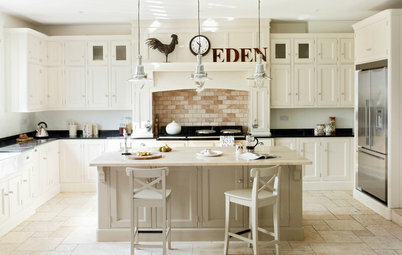 The kitchen, adjacent to the formal living room, proved an exercise in old meets new. 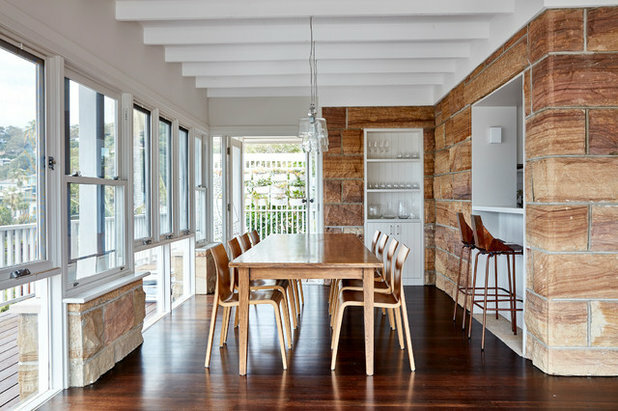 One of its most striking features is the v-groove boards, seen here in the joinery. 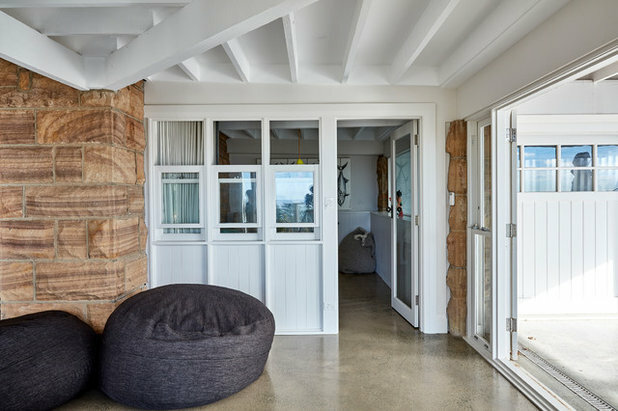 As well as adding texture, this singular detail bridges the gap between old and new and subtly references the home’s beachside setting. 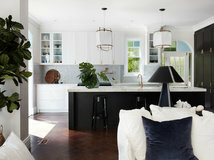 Bentley retained the position of the kitchen in the centre of the floor plan, but opened it up to better connect the space to the dining area and views beyond. 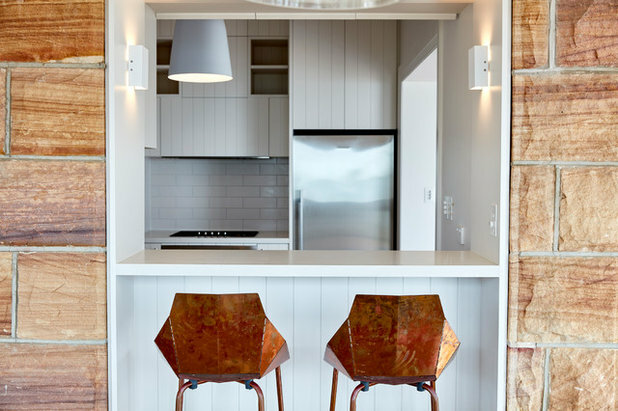 The dining and living zones wrap around this central cooking space, effectively locking it into the floor plan and linking it to the family areas via this little window above the breakfast bar. Instead of concealing the building’s materials, Bentley and the owners made a conscious decision to expose them. 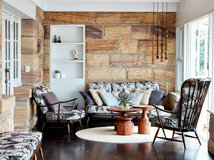 This is seen in the raw sandstone blocks inside and out, the ceiling beams that stretch across the space, and the historical detailing that commands your attention. 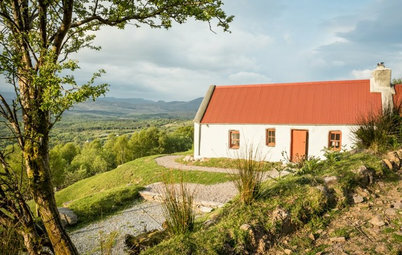 This honesty of materials is one of the beauties of older buildings – instead of being hidden behind plasterboard, you can see a home’s structural elements in all their glory. 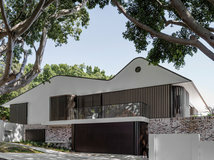 Bentley added the vast wraparound verandah that girdles the house – a sensitive extension that echoes the building’s historical bones in its design, material and overhead treatment. 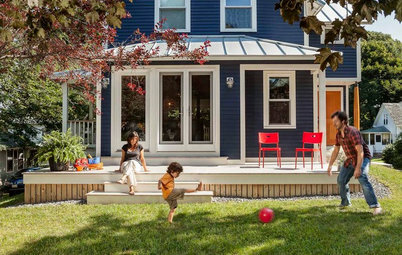 Wide swathes of windows and French doors connect this outside space to the public living areas inside, encouraging the family to use the deck just as much as the interior. 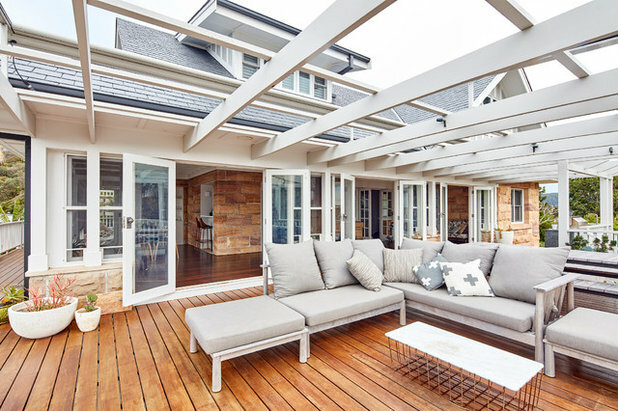 It’s not just living spaces that unfold to the new deck. 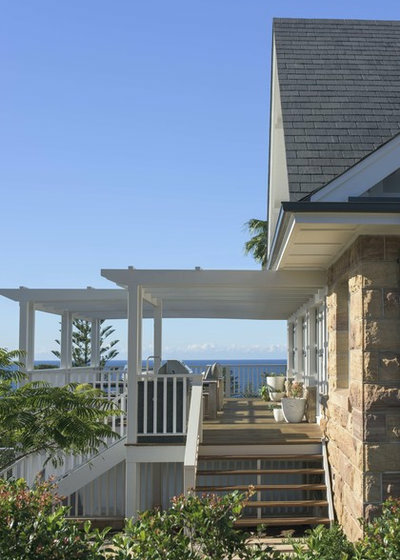 This private eastern bedroom on the ground floor opens up to the verandah as well, and boasts spectacular views to the beach. 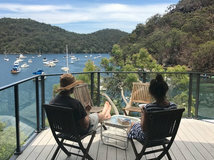 “It was really important to the owners that it wasn’t too precious, that it was a comfortable, accessible and liveable home for the family to holiday in and feel relaxed and at ease in,” says Bentley. 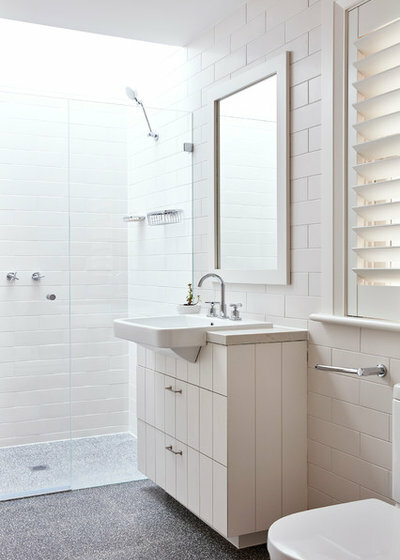 Here, the ground floor family bathroom offers a room with a view to unwind in with a long soak in the tub, while being an equally practical space where sandy feet can be rinsed off after a swim at the beach – all while graciously combining the old with the new. “There was never any intention for the house to feel modern, so there was no great battle in that respect,” says Bentley, speaking of balancing the new design with the original 1920s features. 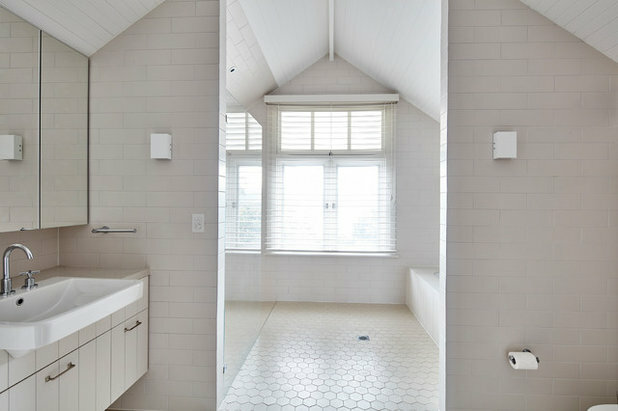 Moving upstairs to the master bedroom and rooms beyond, Bentley took the same approach to preserving the building’s historical elements. 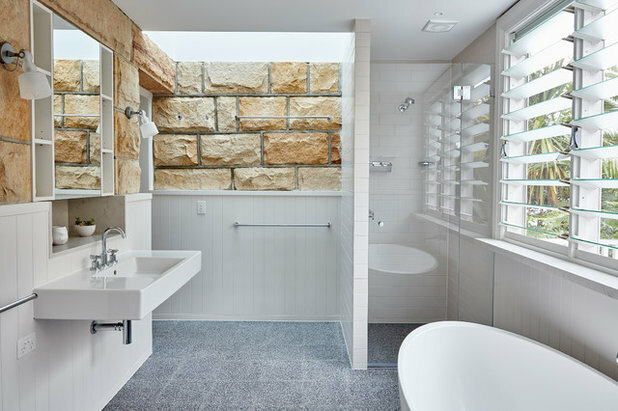 In the master bathroom – a grand space that frames the green national parks and blue bays of Pittwater – Bentley let the original sloping roofline shine to pay homage to the home’s bones. 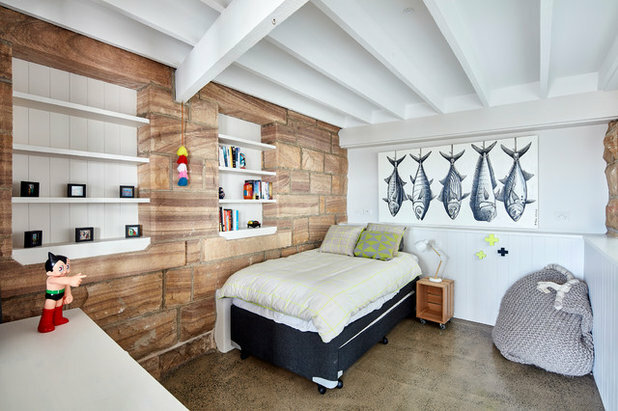 Below the ground floor kitchen and living areas, there is a series of den-like rooms, including this children’s rumpus room. 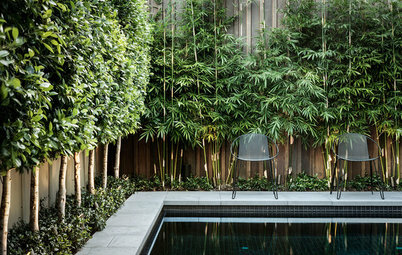 Originally this space was an outdoor area, but Bentley enclosed it to create what is seen here, a sequestered play room that leads to a pool out the back. 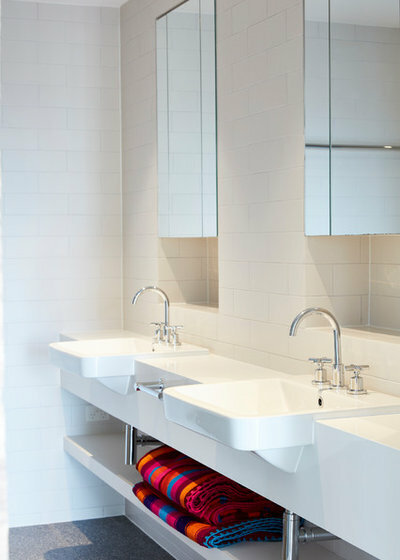 On the same level, the children’s bathroom is both a contemporary and functional space – a must when designing to accommodate for younger souls and the wild adventures that can unfold at bath time. 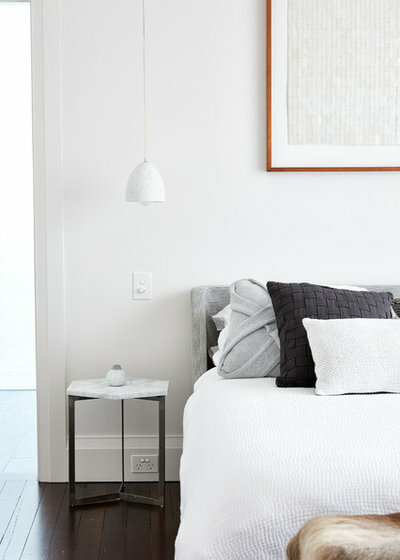 Glance quickly at any of these spaces and they exude the confidence of rooms that have belonged in a home for a very long time. And when you consider how rundown this original home was before Bentley arrived on the scene, this in itself is quite a feat. 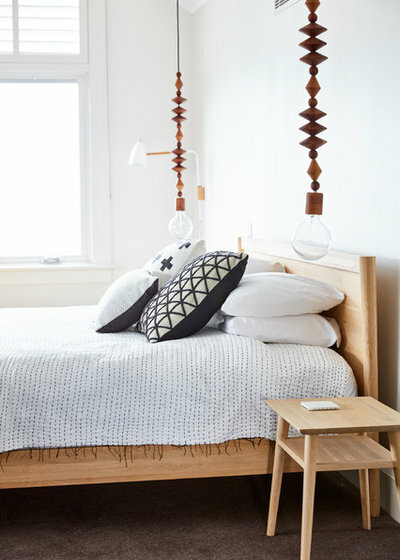 “As I understand it, the previous owners hadn’t spent a lot of time there and it was pretty evident,” she says. 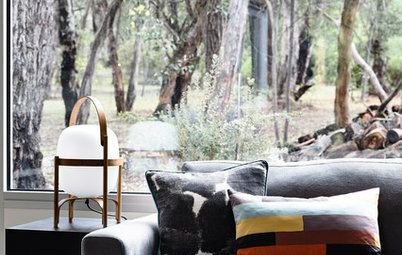 What’s your favourite space in this historical home? Share your thoughts in the Comments, save your favourite images and like or save this story. 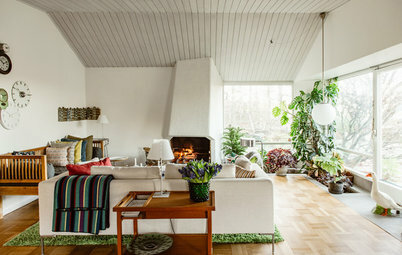 Did you miss last week’s Houzz Tour: The Reno That Put a 1970s House Ahead of the Curve? It's wonderful to know how much our readers appreciate this historic home as well. 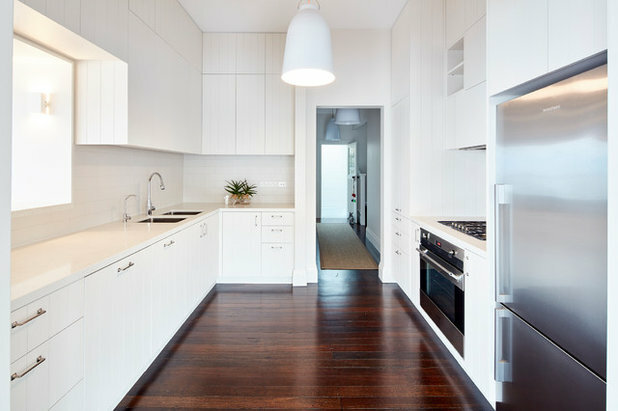 Absolutely, @ChrisHodge, there is a definite 'Hamptons' flavour to the renovated interior, particularly with the v-grooves in the joinery which feature strongly in the kitchen. 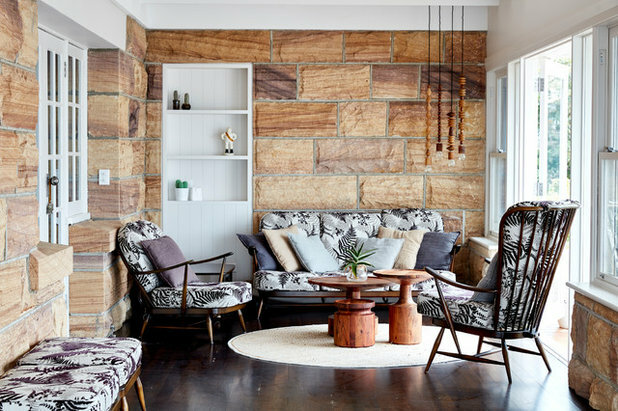 The sandstone and period features represent different styles again, though one of the feats the designers and construction teams have successfully achieved with this home is to fuse quite a few different aesthetics under the one roof. Thanks! Love, love, love - everything! 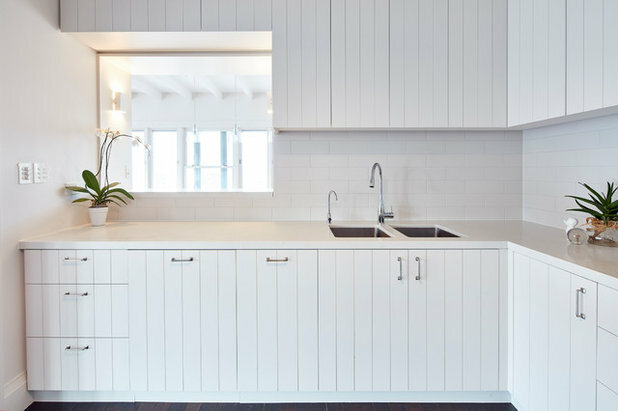 Building Components Rock Solid: Which Natural Stone is Best for Your Kitchen Bench?